This is a very special breeding. Claire is is a Dutch import living in California. Kiet is a Belgian Drent with excellent conformation. Claire and Kiet are registered with the Dutch and Belgian breed clubs, respectively. (Kiet is the son of Ferron van Drentenpassie, the stud for Claire's first litter.) Since both parents are European, each pup will be like an import, unrelated to any North American Drent apart from Claire's first pups and Claire's two imported siblings. Claire came into heat in late-October 2018 and flew to Europe on November 5, 2018. The breeding happened on November 7. Pups have been confirmed by ultrasound and are expected about January 5, 2019. This breeding has taken an exceptional effort, but the results will be worth it. The pups from Claire's first litter are amazing. Claire is a Belgian-bred and Dutch-born import to the United States. She is sweet and affectionate towards family and friendly to strangers. Both parents are active and successful hunters, so it is no surprise that Claire works intensely and efficiently in the field. 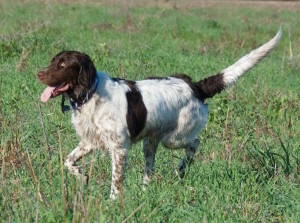 Her father received the 2011 "Nimrod" award as the all-breed hunt test champion in Belgium. View Claire's pedigree. View Claire's orthopedic certificates..
Kiet lives in a small town near Antwerp, Belgium and is an accomplished hunter. He is a sweet and gentle soul with a loving disposition, but is on guard when watching over the family home. In the Dutch breed club's 2017 match, Kiet placed first among open class males. 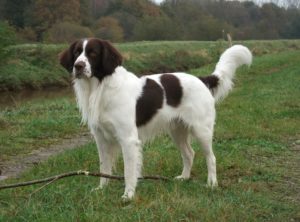 The Dutch breed club recently evaluated Kiet as well as other males from Belgium and the Netherlands as potential studs. He received the highest qualification of "uitmuntend" (excellent). View Kiet's pedigree. View Kiet's hip certificate. View Kiet's Dutch breeding evaluation..